"Opie and Barney are a lot alike. Granted, Opie may be a bit more mature, but they both enjoy toys and games. Barney may be no match against Opie in checkers, but he still thinks he can show him a thing or two about the 50-yard dash. Barney also obliges Opie with instructions on how to use a slingshot and throw a football. Fortunately, Opie doesn't depend on Barney for all of his instructions." The collector cards were released in 1990 by Pacific Trading Cards, Inc. of Lynnwood, Washington. The pictures on the front of the cards came from promotional items and from photo stills taken during the show's production (1960-1968). 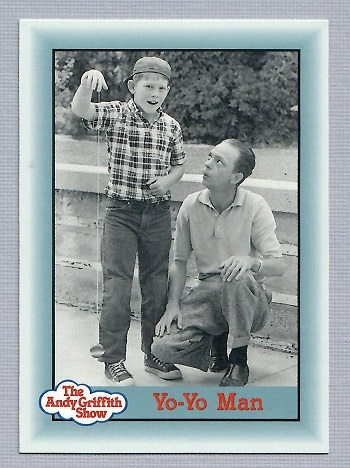 See an alternate outtake picture of Opie yo-yoing in the exhibit below.